The two events were identified in July and August 2016, respectively, by the Gaia Photometric Science Alerts Team, who scrutinize the Gaia data looking for astronomical sources that are, for a short period of time, much brighter than usual. When such a massive object is exactly aligned between a distant source of light and an observer, it acts as a gravitational lens, and the observer may see a dramatic increase (and subsequent decrease) of the source's brightness – much like when we observe something through a magnifying glass. This phenomenon is called gravitational microlensing. Gaia's first detection of such an event, classified as Gaia16aua and nicknamed by the team Auala, after a small village in Samoa, is a faint star of magnitude 19 that suddenly brightened by two magnitudes. 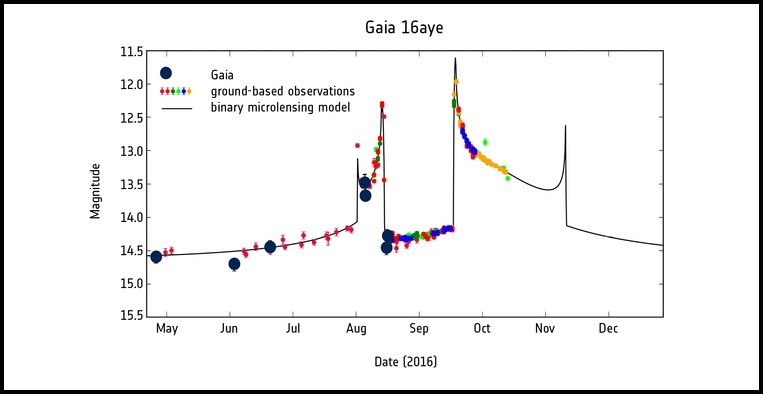 The brightness rise and subsequent decrease were observed independently, both by Gaia and by the ground-based Optical Gravitational Lensing Experiment (OGLE). 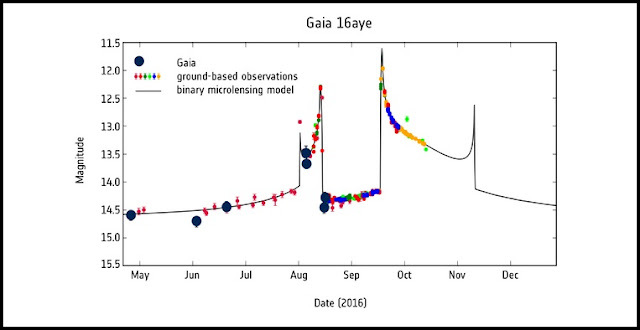 The ground-based observations provided a longer and denser baseline of data, confirming that the brightness variations observed by Gaia were actually caused by a microlensing event.